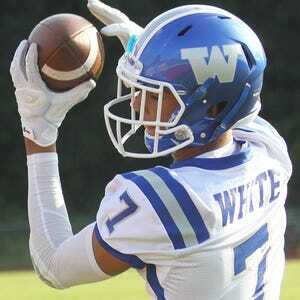 Walled Lake Western receiver Cody White has committed to Michigan State’s 2017 recruiting class, he wrote on Twitter. White (6-3, 175) is ranked the No. 4 receiver in Michigan and the No. 73 receiver nationally by Scout.com for 2017. White had 49 catches for 927 yards and eight touchdowns last season. He also had four interceptions as a defensive back. He made The Detroit News All-State and All-Metro North teams. White’s grandparents went to Michigan State and his father, Sheldon White, is the Detroit Lions’ former director of pro personnel.